Are your brakes screeching, squealing, or grinding? DON’T WAIT! Do you wonder if you need brake repair Murrieta? How long can I wait to get my brakes fixed? Will waiting to fix my brakes really make things worse? Is it expensive to get my brakes fixed? Is it dangerous to have bad brakes? What parts of the car can wear out when the brakes are bad? Once you hear the brakes start squealing or screeching it’s time to get new pads. Don’t wait or it might cost you more because you can ruin other parts of the braking mechanism. Brake repair is an easy fix but that repair might become more expensive if you wait. 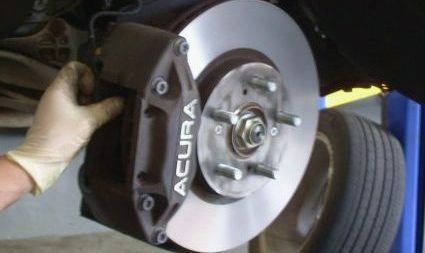 Once the brake pad is completely worn out (that’s when you start hearing the screeching) you risk damaging the rotors. If the rotors warp you may need to replace them. Call us if you need brake repair Murrieta! Is it expensive to have my brakes fixed? No, every car is a bit different but repairing brakes is generally a common and inexpensive procedure that our mechanics in Murrieta do on an almost daily basis. Call the brake pros in Murrieta! The brakes and suspension in a car are crucial to its safety. Braking the car when traveling at high speeds requires not only brakes but a properly tuned suspension. At California Car Care we specialize in brake repair Murrieta and Temecula. You can be in and out with brand new brake pads & shoes.